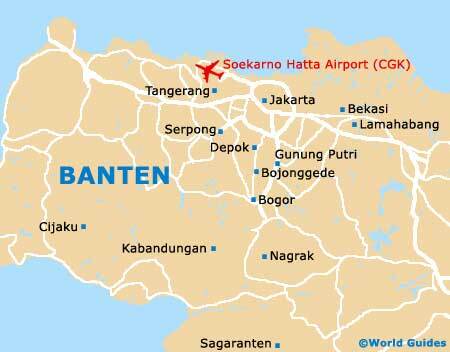 Banten is a sizeable province, located on the far western side of Java. Home to a total population of around ten million people, Banten is divided into a series of four different regencies, which are known as 'Kabupaten' (Lebak, Pandeglang, Serang and Tangerang). Banten also features a total of four city municipalities (Kota) as follows: Cilegon, Serang, Tangerang and South Tangerang. Serang serves as the provincial capital and administrative centre, and is mainly inhabited by Javanese, while in Tangerang, the population is predominantly Sundanese. Enjoying a coastal setting on West Java, Banten offers a number of appealing beach resorts, which entice large crowds of holiday makers each year. These include both Anyer and Labuan (Labuhan), which reside within Cilegon, as well as Cikawung, Malingping and Bayah, on the southern shore.